Official War Office guide to the First Battle of the Aisne in September 1914 in which the BEF helped the French push the Germans across the River Aisne. The battle marked the change in the Great War between the war of movement and trench warfare. 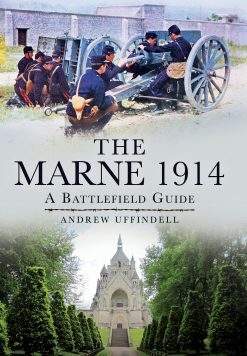 The First Battle of the Aisne, between 12-15th September 1914, was essentially a follow-up to the Battle of the Marne (8-10th September) in which the German advance on Paris had been checked and then turned back. This pamphlet, maps and tour is the official War Office guide to the battlefield, which was the watershed between the war of movement and the beginnning of trench warfare, published in 1934. 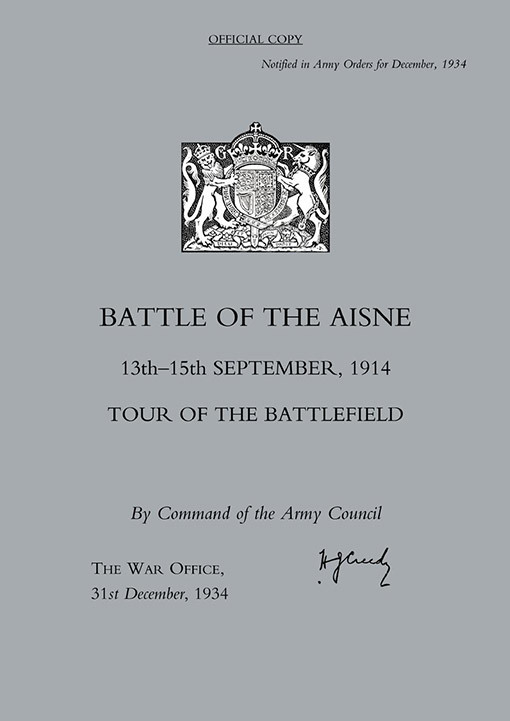 Acting in conjunction with the French Fifth army on its right, and the Sixth Army on its left, and under the orders of the French C-in-C Gen. Joffre, the BEF advanced on the 12th, gaining the heights south of the River Aisne, and on the left south of Venizel reached a bridge over the river itself, which was captured that night in heavy fighting. To the left of the BEF, the French had also reached the Aisne between Compeigne and Soissons, while on the right the French had reached the River Vesle between Beaumont and Fismes. By the night of the 12/13th the gap between Von Kluck’s First and Von Bulow’s second Armies had widened to 18 miles, making it difficult for the Germans to man a defensive line along the Aisne. On 13th September the BEF crossed the Aisne, despite heavy opposition from the Germans who had brought up reserves to strengthen their line. On the 14th, hampered by a heavy mist, the BEF made little progress in their advance; fighting was intense and losses heavy, with every battalion but one of the BEF engaged. On the 15th, the final day of the battle, GHQ ordered the BEF to entrench the positions they had reached. Determined German counter-attacks were all repulsed. 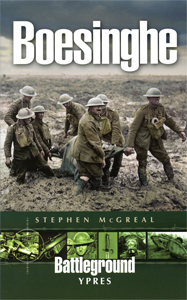 The guide gives an account of the battle, notes from the 1914 Training Manuals; lessons learned from the fighting; a study of operations at night; and the order of battle for the British, French, and German forces engaged. The pack comes with three main battlefield maps illustrating the unfolding action and five sketch maps showing the stands to view the panorama of the battlefield. 2005. N&M Press reprint (original pub 1934). SB.56pp with 3 large full colour maps (printed over 19 pages) & 4 panorama sketchies.